The Clydach Refinery, affectionately known as the Mond, was built in Clydach, near Swansea at the turn of the 20th century and started production in 1902. The plant was built by Ludwig Mond, the inventor of the nickel carbonyl process. 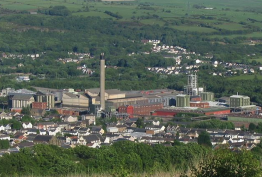 During the 100 years since it began production the Clydach refinery has become the largest and most versatile nickel refinery in Europe. The original 30-acre site has now grown to 55- acres. The site produces about 40,000 tonnes of nickel products per annum. The products are made in pellet form for use in stainless steel appliances, nickel plating and special alloys for anti-corrosive applications. Another major processing line produces nickel in powdered form. These products are utilised in a diverse range of processes including the production of rechargeable batteries and catalytic converters. Envirotreat have been involved in several projects at the Clydach Refinery. In 2010, Envirotreat were commissioned to evaluate treatment options for the Bobby Waste stream produced on the site. The waste comprises of filter bed media from the on-site water treatment plant. After prolonged use the filter media becomes coated in nickel deposited on the surface and as a consequence, the media becomes ineffective and requires replacement. The used filter media has traditionally been disposed of at a landfill in England at a distance from site exceeding 100 miles. This was considered to be unsustainable. Vale therefore undertook to identify a more sustainable and economically viable alternative to offsite disposal. Envirotreat demonstrated through treatability trials that the Bobby Waste could be treated to inert status, enabling cost effective disposal at a local landfill. Having demonstrated that the waste can be satisfactorily treated, Envirotreat were commissioned to undertake the on-site treatment of 150 tonnes of the waste. In 2011, Envirotreat were commissioned to look at other waste streams generated onsite, including the Bobby Waste, contaminated soil arisings resulting from recent civil engineering works at the site and copper bearing waste. The treated material was required to comply with an engineering fill specification and a risk-based remediation criteria for groundwater protection. All three waste streams were treated with a stabililisation medium incorporating a designated E-Clay formulation to achieve the required engineering and environmental target objectives.